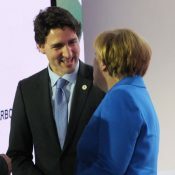 They spoke in four different languages, but the leaders of Canada, Chile, Ethiopia, France, Germany, and Mexico shared one message yesterday at a high-level event in Paris: The time for carbon pricing has come. 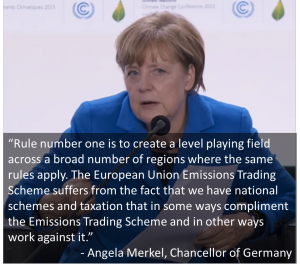 1 December 2015 | PARIS | The leaders of Canada, Chile, Ethiopia, France, Germany, and Mexico called for other country governments to follow their lead in putting a price on carbon. 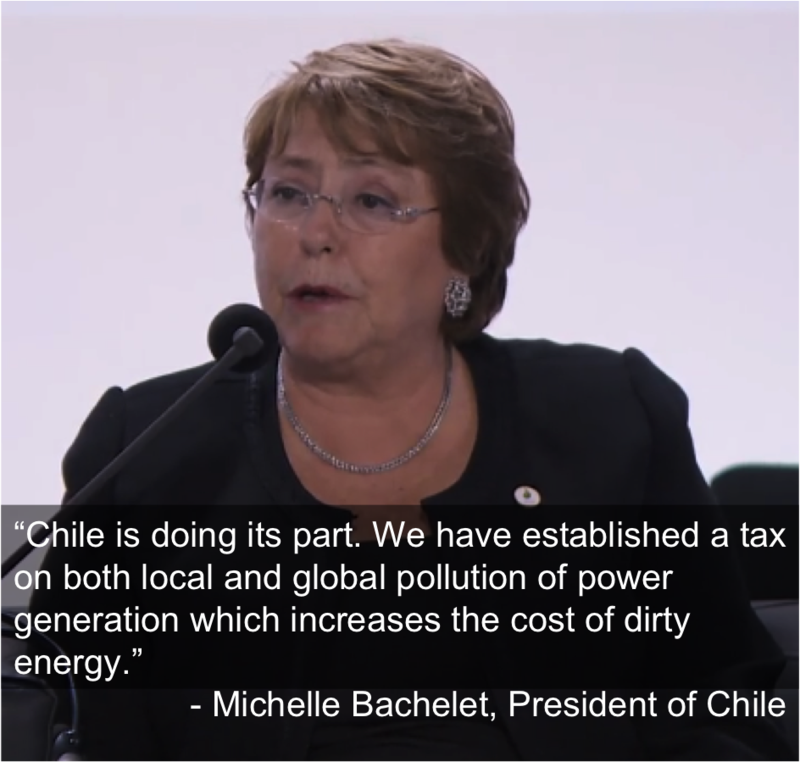 Speaking at a press event yesterday, the first day of the United Nations climate talks in Paris, Canadian Prime Minister Justin Trudeau, Chilean President Michelle Bachelet, Ethiopian Prime Minister Hailemariam Desalegn, French President François Hollande, German Chancellor Angela Merkel, and Mexican President Enrique Peña Nieto offered perspectives on implementing carbon pricing policies at the national and subnational level. 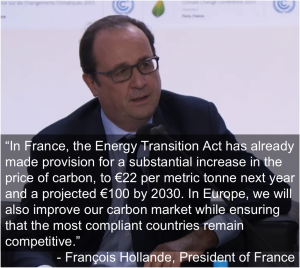 The subtext: France’s carbon tax covers domestic use of natural gas, heavy fuel oil, and coal not already accounted for under the European Union Emissions Trading System. A 7 euro tax per tonne tax went into effect in 2014, with set increases to 14.5 euros per tonne this year and 22 euros per tonne in 2016. 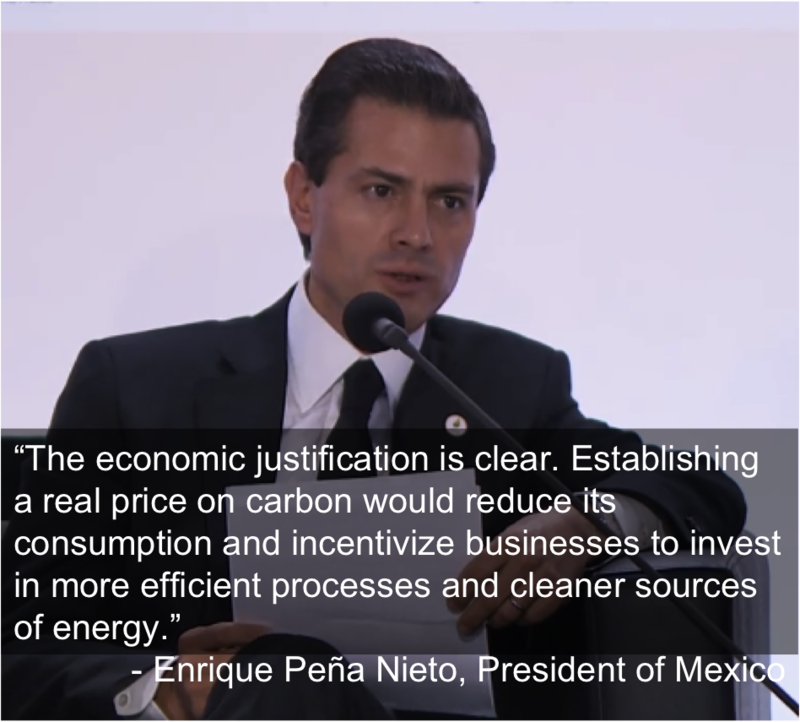 The subtext: In January 2014 Mexico implemented a carbon tax, set at about $3.5 per tonne, on importers and producers of fossil fuels, though natural gas providers are exempt. Firms are allowed to use Clean Development Mechanism offsets from Mexican projects to meet the regulation. 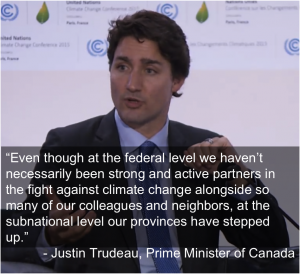 The subtext: Even the PM acknowledges that Canada is known more for its oil sands than its climate leadership. But as Trudeau notes, the real action is in the provinces. British Columbia implemented a carbon tax in 2008, and Quebec last year linked its cap-and-trade program with California’s, with Ontario recently announcing plans to make it a trifecta. Even Alberta, Canada’s biggest oil-producing province, will implement a C$20/tonne carbon tax in 2017, ramping up to C$30/tonne by 2018. 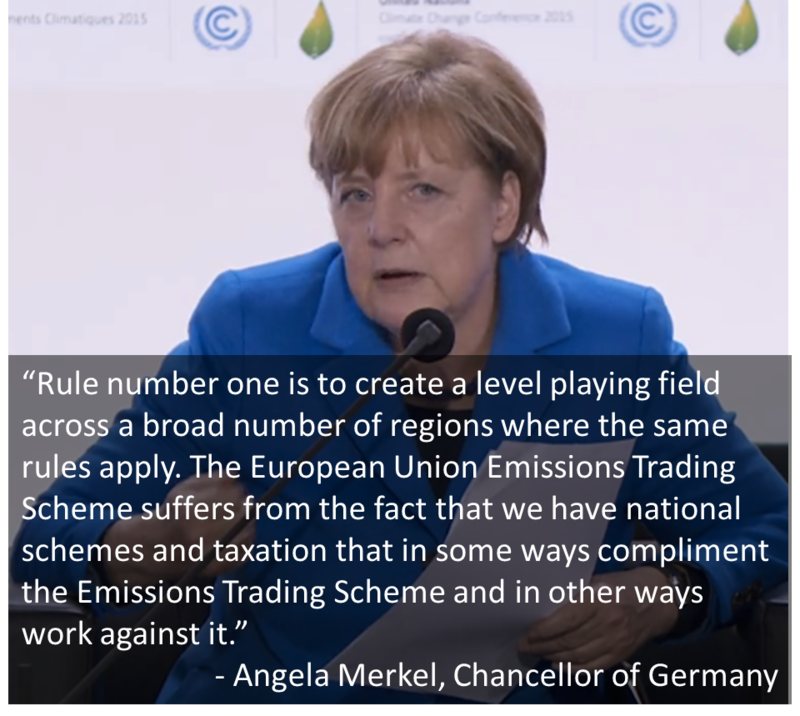 The subtext: Industrial Germany has been generous in supporting forests abroad and was a strong proponent of the European Union Emissions Trading Scheme (EU ETS), which fell short for a variety of reasons: some political (lack of real commitment on the part of leaders) and some structural (governments allocated too many credits, and different countries followed different rules). 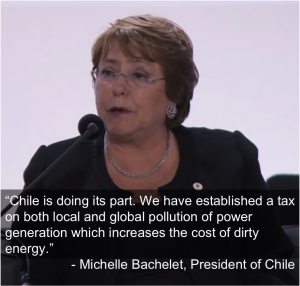 The subtext: In 2014, Chile approved a carbon tax of $5/tonne of carbon dioxide for thermal generators with a capacity of more than 50 megawatts. Biomass generators are excluded, and the policy will go into effect in 2017. The subtext: Ethiopia is hoping it might be on the receiving end of funds raised through carbon pricing initiatives globally, and Desalegn noted that “we have amply opportunities in our forests and land to absorb a substantial amount of carbon” – a not-so-subtle shout-out to REDD+ (Reducing Emissions from Deforestation and forest Degradation) finance. 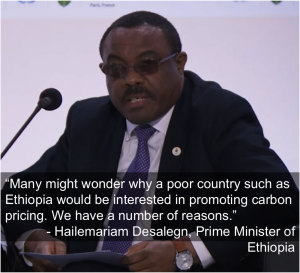 But for the Prime Minister, carbon pricing is also about economic efficiency, since vulnerable countries have an interest in seeing clean energy technologies deployed as quickly as possible. The subtext: Kim framed carbon pricing as a justice issue, saying that climate change could push another 100 million people into poverty by 2030, almost half of them in Sub-Saharan Africa. 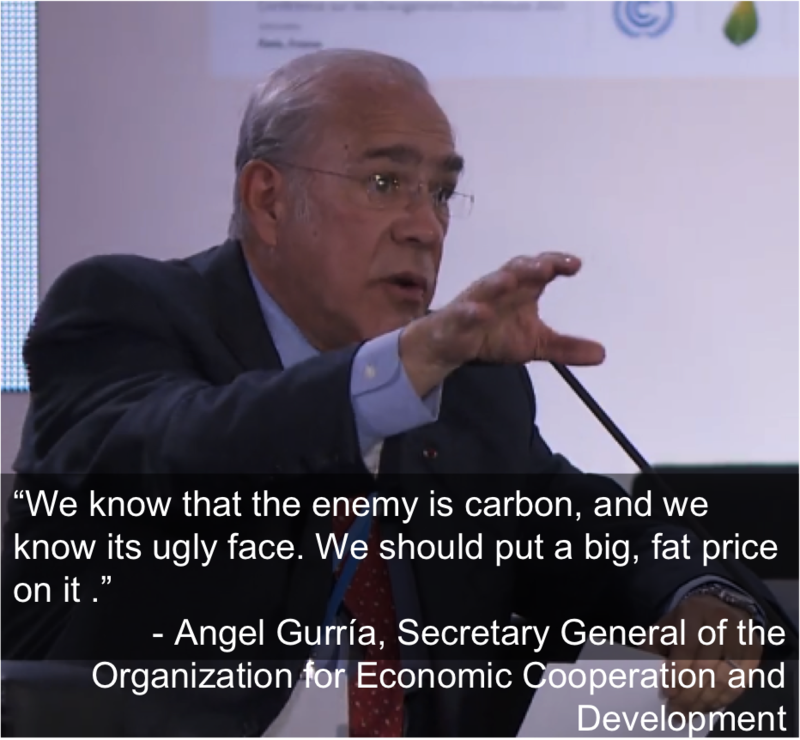 Carbon pricing is critical for protecting the most vulnerable, he said. 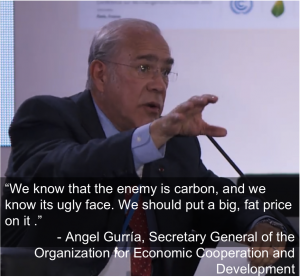 The subtext: Gurría took a stand on which carbon pricing mechanism is best, saying that with the exception of perhaps the California-Quebec (and soon Ontario) linked cap-and-trade program, straight-up carbon taxes have been implemented more successfully. He recognized that “tax” is a dirty word for some politicians, which is why cap-and-trade is often favored, but he called this reasoning “trivial.” “If it works better and we know it works better and we know it bites and it changes conduct, then perhaps it should be the choice,” he said. The high-level panel was convened by World Bank Group President Jim Yong Kim and the International Monetary Fund’s Managing Director Christine Lagarde. 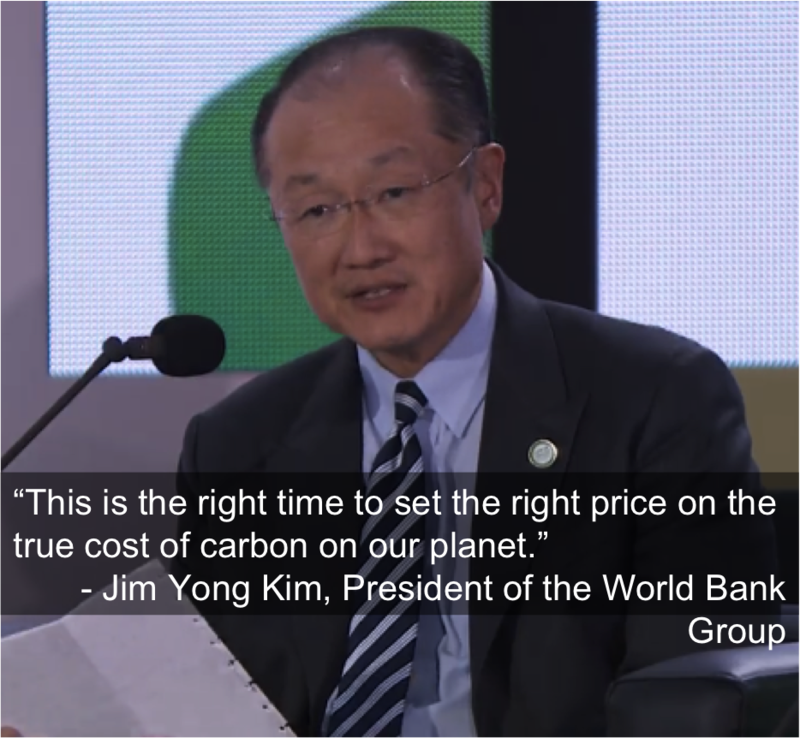 The event marked the official launch of the Carbon Pricing Leadership Coalition as well as the Transformative Carbon Asset Facility, a $500 million initiative launched by Germany, Norway, Sweden, Switzerland, and the World Bank Group aimed at spurring carbon pricing initiatives, especially in developing countries. In addition to the six heads of state that championed carbon pricing on Monday, the Carbon Pricing Panel also includes Filipino President Benigno Aquino III as well as two subnational leaders: Governor Jerry Brown of California and Mayor Eduardo Paes of Rio de Janeiro. All told, 40 countries and 23 cities, states, or provinces covering about 12% of global greenhouse gas emissions have put a price on carbon either through a cap-and-trade program or a tax, according to the World Bank.